Does Good and Evil Really Exist? Themes in literature, film, TV programs, and other media frequently deal with good and evil or evil dominating the world. Yet I question whether there really is good and evil. It is often a matter of perspective. There are those in the U.S. who think the Taliban are evil because they kill Americans, spread terrorism, and want to establish governments where their form of fundamentalist Jihad Islam rules. They however likely see the U.S. as the evil aggressor invading their lands, killing their families, relatives, and friends, and trying to force Western Democracy down the throats. So there really are two different points of view. What really is good and evil? They are actually moral labels or judgments we assign to people, actions, or things regarding their benefit or harm to us individually or to something else of value to us. Good does not necessarily have a religious connotation but evil implies a higher force often associated with the devil. Both are perceptions, good often implies the giving of oneself for the benefit of others as ones purpose and evil the doing of harm to others as ones self-serving mission. In either case its the one that is thinking of good and evil that is making the moral judgment and assigning the label. I believe that absolute good and absolute evil are self-destructive thus cannot exist for long. If one does selfless deeds for others to the exclusion of one’s own health and safety then that person would not survive for long. Such a purely good person would eventually die of poor health and self neglect or get run over by a truck when rushing across the street to help another. Pure evil has similar problems of being so consumed with hatred in harming or destroying another that evil neglects to take care for its own survival and ultimately self-destructs. I reject the concept of evil because of its religious connotations and lack of rational and replace it with bad since bad can mean intentionally or unintentionally having a negative effect just as good can be intentional or unintentional, whereas evil always implies intention and is absolute with only one point of view. More good implies less bad and visa verse and is relative to whose point of view is being taken. All intentions and actions by individuals contain a mix of both just as controlling a car is a mixture of acceleration and breaking. Too much acceleration and not enough breaking can be bad news just as doing too much good for others without looking after one’s health and safety can be bad news for the giver. The issue is always striking a sustainable balance which produces the most overall balance or harmony. If everyone maintains such a healthy balance in life then we will not need good heroes to offset the bad doers. Everyone would be looking after others while keeping themselves healthy and safe. In some cultures such as Japan the community is often stressed above the self. In others such as here in the U.S. the emphasis is upon the individual. Extremes of both can have adverse consequences. A healthy balance between the rights of the individual and the need of the community works best. The problem is how to determine the most overall beneficial balance? Being aware of this possible dichotomy is a good start. Such an activity must be sustainable and its results most beneficial to all in the long run. Good and bad are not only intentions but results as well which are distinctly different things. A good intention can have a bad result and visa verse. For example taking a nice and well-earned vacation can result in a disastrous accident or the loss of a limb in a disastrous accident can lead an individual to become a stronger and better person. There are ethical questions as well that arise when doing something apparently good. Medical miracles that save and prolong life are considered good. But this may result in more people being born and living longer than dying. This create an over population problem as exists today. Two hundred years ago when modern medicine didn’t exist our population was below one billion. Today, due to the many miracles of modern medical science, fewer people are dying at birth and more living longer lives than ever before. Thus our population just two hundred years later is more than seven billion and climbing. This has created a problem that people are consuming more resources and polluting the earth far more than is sustainable. Excessive greenhouse gases generated by us may ultimately lead to our extinction (see Global Warming – A real threat to all Life on Earth). Thus good means good for you and me but bad for the long-term survival of our and other species. But once the genie is out of the bottle it’s almost impossible to put it back in. We face many ethical questions about doing things with obvious short-term benefits but totally neglecting to consider the long-term consequences. Thus good is not always that good as in the over population example just given nor is bad necessarily always that bad. To give an argument about the benefits of bad one can consider illness and death. Most certainly dying is bad news to the dying. But death is a natural consequence of keeping our population in check. So death is beneficial toward the long-term survival of our species. For most species when the population grows out of control something happens, such as disease and starvation, to counter it and maintain the balance of nature. But for mankind modern science has minimized such natural control measures. Thus our dilemma poses ethical questions about what to do about it that remain unanswered and largely ignored due to the unpleasantness of addressing mortality rates or birth rates. These example illustrate how relative good and bad can be. It often depends upon ones vantage point. Good for one person might be bad for another especially if they are competing on opposite side such as on team sports or in politics where there are winners and losers. 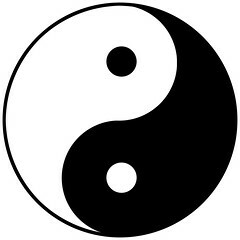 The ancient Chinese developed a philosophical concept of Yin-Yang which is a lot less ambiguous than good, bad, and evil. In this concept all things consists of combinations of Yin and Yang or complementary forces. The Chinese would often refer to this as hot and cold or East and West winds. Too much of one or too little of the other is undesirable. The proper combination of both results in the optimum overall benefit. This is much the way I view life. I see nothing that is pure black and white in the world. Instead I see many shades of grey. In this concept there really is no good, bad, or evil. Instead there are things that are more or less beneficial depending upon ones reference point as to who is on the giving and receiving end. This entry was posted in Personal Perspective and tagged bad, ethics, evil, good, Good and evil, intentional, morality, perceptions, religious, Yin-Yang. Bookmark the permalink.